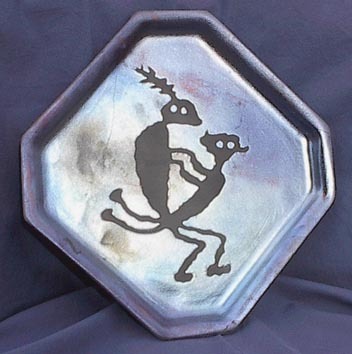 Each Rock Art Pottery piece is individually hand-crafted using a variety of clays and firing techniques to produce unique, one-of-a-kind artworks. Firing temperatures range from earthenware to high-fired stoneware. 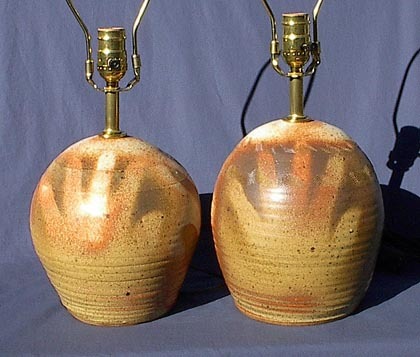 Firing techniques include raku, oxidation, reduction, and sawdust/pit firing. 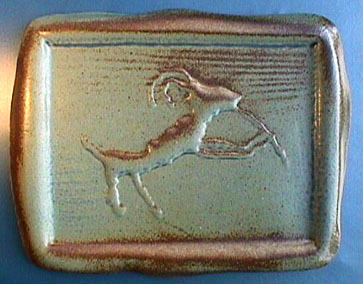 Clays include porcelain, stonewares, raku and earthenware. 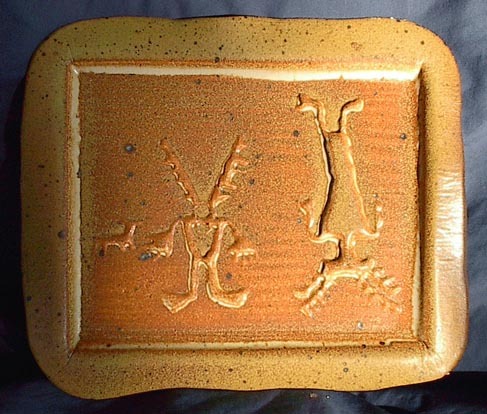 Rock Art Ceramics are photorealistic representations of actual prehistoric rock art glyphs selected from thousands of glyphs studied over the course of a decade. J. Q. has spent a year visiting and recording rock art sites. 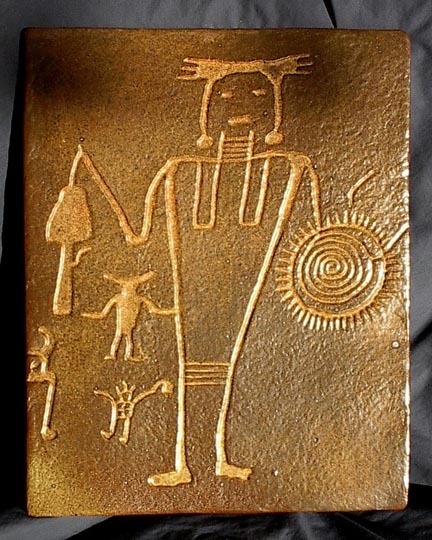 He carefully creates artwork true to the images of the prehistoric glyph makers. Photorealism is a trademark of Rock Art Pottery. View more rock art pottery. To acquire pieces contact me. 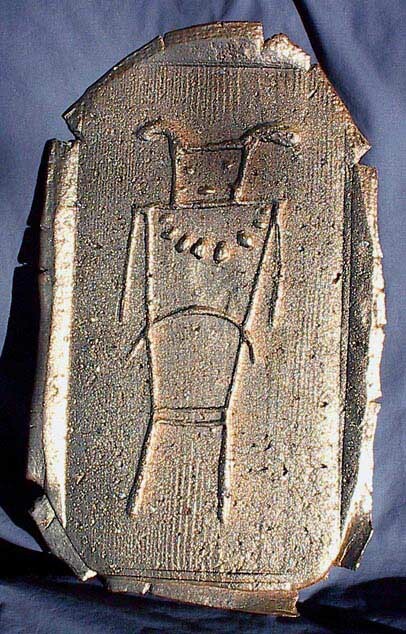 Rock art is a fragile and important cultural resource. 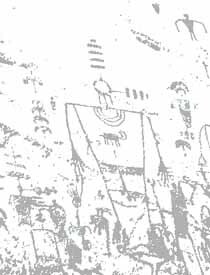 Please help preserve rock art for future millennia. 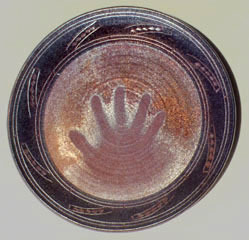 When visiting rock art sites please observe modern site etiquette; look, do not touch and take only photographs. 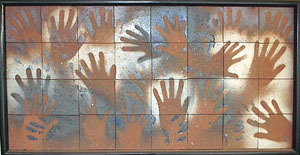 How are the handprints made? By spraying the glazes. CAUTION. Remember, glazes are chemical mixtures and safety must be considered. Whenever spraying glazes, overspray needs to be captured, the spray should not come in contact with your skin, and, most importantly, your respiration needs to be protected to keep particlates out of your lungs. 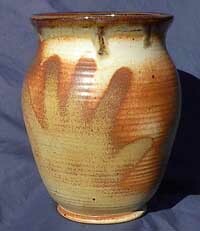 Glaze formulas, like clay itself, contain known carcinogens such as silicates. Tight fitting gloves should be used, latex inside cloth. Just using a latex glove will result in unwanted dripping. As seen in the handprints jar, spraying allows for control of glaze thickness, resulting in a beautiful gradient of colors with some glazes.